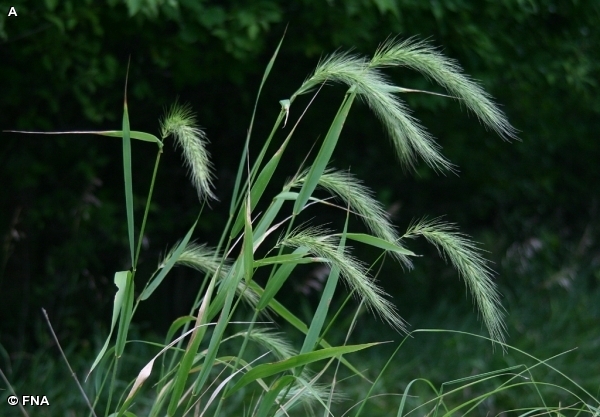 Elymus canadensis.© Fontenelle Nature Association.www.fnanaturesearch.org (accessed 5/2014). Elymus canadensis is a perennial C3 grass (Reich et al. 2003), tufted, to 1.5 m tall, often waxy pale-gray-green. Leaves usually 4-9 per stem, 0.3-1.2 cm wide, base of blade brown-edged, small tabs extending from upper corners of sheath and clasping stem, ligule membranous, short. Flower spikelets in pairs at each node on alternating sides along spike, flat side to axis, to 1.5 cm long (not including awns), 3-4 florets, glumes bristle-like but flexible and flat to 3 cm long, lemmas to 1.4 cm plus awn to 3 cm long, curving outward when mature; inflorescence spike 10-20 cm long, densely long-bristly, arching or nodding, dense above, often interrupted below; blooms and fruits July-Oct.
Habitat: Dry open areas, soil pH 5-7.9 (USDA, NRCS 2010). Notes: Sometimes planted in grassland or meadow restorations.